Taking care of your vehicle in the winter is very important for your safety. Winter can bring many challenges for drivers, such as icy roads and salted streets. 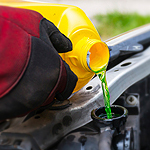 For this reason, it is important to know some car care tips that will keep your car in great shape all year long. It is important to make sure that your vehicle has proper lighting. The sun sets earlier in the day than in the winter months, creating a major hazard for drivers. You will want to make sure that the lighting on your vehicle is in excellent shape, providing the brightest illumination possible. It is more difficult for your car battery to operate properly in the colder months compared to warmer months. In order to make sure that your battery is working properly, you should have a volt test performed on your battery before winter starts to ensure that it is working properly.